Spring has sprung at Equicizer! We have been busy! The Equicizer was spotted on Twitter at the High Hope Steeplechase pony races on April 24th. 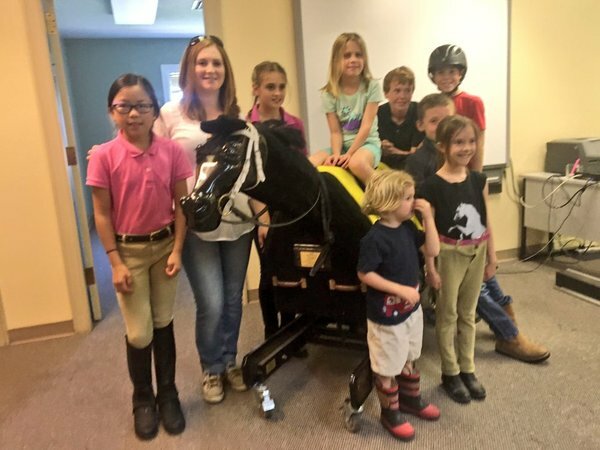 We are so happy United States Pony Racing makes the Equicizer a part of their training and events! Don't forget to take advantage of the Equicizer-based training sessions offered by Equifitt Fitness Expert Heather Sansom! All Equicizer Owners can take advantage of a 50% discount on one phone or Skype training session! New Equicizer owners (purchase made since December 2015) can enjoy this discount plus a bonus ebook and a discount on a full training package! Frankie and Kayla made the journey to Indiana to meet up with Steve Lantvit and Make-A-Wish Foundation. On March 31st, Equicizer founder and creator, Frankie, and Office Manager, Kayla, made a journey out to Indiana with a few Equicizers. There, they met up with horse trainer and clinician Steve Lantvit. 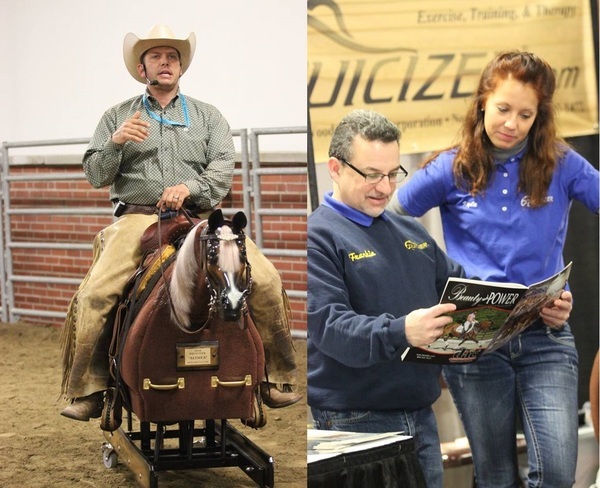 Steve offered multiple clinics and presentations using the Equicizer at the expo and gave demos at the Equicizer booth. He specializes in training well-rounded and versatile equestrians and finds the Equicizer to be an invaluable tool in doing so. A cool moment came when Joe and Michelle from the Horsemen's Corral brought over the April issue of the magazine (in which the Equicizer was featured on pages 12-13) and Michelle found it to be the perfect photo opt. You can view the magazine and article by clicking here. The entire Hoosier Horse Fair weekend was a lot of fun and a great success! Did you stop by our booth and take a ride on the Equicizer? Were you there for the Steve Lantvit clinics? We encourage you to share your stories and photos on social media or you can email us! Also as part of the Hoosier Horse Fair weekend, Wooden Horse Corporation was proud to donate an Equicizer to the Make-A-Wish auction. The Equicizer was auctioned off Saturday night. An Equicizer by the name of Kalliope recently became a part of kidspOT Therapeutic Services in South Burlington, Vermont. An article by WCAX details how Lori Sullivan, an occupational therapist, initially faced challenges with insurance coverage while operating a live-horse hippotherapy program but then found success with the Equicizer in her indoor center. Read more and check out the video here. 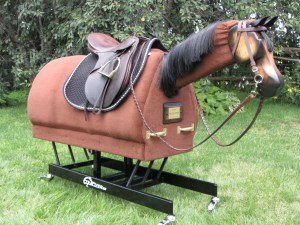 The Equicizer has long been popular with equestrians both in the United States and abroad. 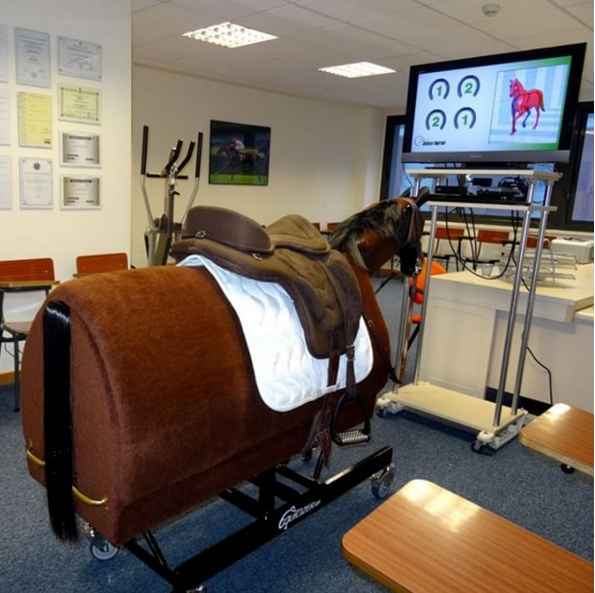 Recently, a center in Sant Cugat del Valles, near Barcelona, Spain built an indoor lessons and training program called Indoor Horse around the Equicizer. Their wooden horse is named Marengo and he just arrived at his new home in April. They offer indoor riding lessons, training and sports performance sessions, rehabilitation and confidence building, equine therapy, and educational classes. 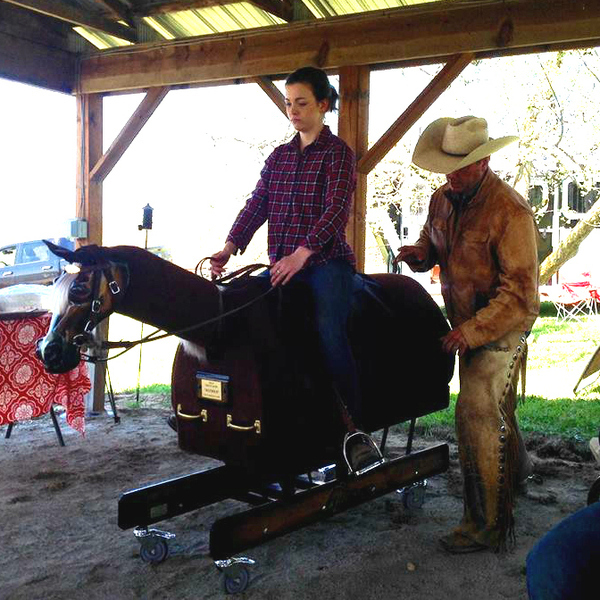 We were happy to join Steve and Jenn Lantvit last weekend at their Highgrove Farm in Indiana for a "Building Rider Confidence" Clinic.​ Althea the Equicizer traveled with us and the participants spent time working on different aspects of their riding. Chelseah is pictured above getting coached by Steve. 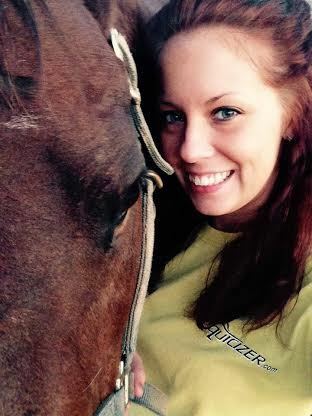 Kayla was born in Flint, Michigan and grew up loving horses, despite having little prior experience with them. She has worked for Wooden Horse Corporation since 2014 - aside from a brief hiatus when she pursued an internship on a Thoroughbred rehab farm... continue reading here! Not on our mailing list? Click below & sign up to receive Equicizer newsletters!